The world's largest package delivery company launches compressed natural gas fueling station and vehicles in Vancouver B.C. MISSISSAUGA, ON, June 21, 2018 /CNW/ - (UPS: NYSE) On June 21, in a move bringing the company closer toward plans to have 50 per cent of its Canadian fleet running on alternative fuels by the end of 2018, new compressed natural gas (CNG) vehicles joined UPS Canada's growing alternative energy fleet. Seven CNG highway tractors and 40 delivery trucks were added to the current Canadian fleet of over 2,900 package cars, tractors and shifters. Presently, more than 40 per cent of the fleet in Canada runs on alternative fuels. "We're always looking for ways to improve our impact on the communities within which we operate. These new vehicles are another step in the right direction," says Floyd Bristol, vice-president of automotive, UPS Canada. "CNG emits 6 - 11 per cent lower levels of greenhouse gas emissions than gasoline throughout the fuel life cycle." 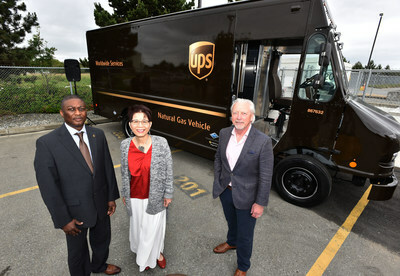 "As an environmentally conscious business, UPS Canada has taken the initiative to reduce its carbon footprint and lower fuelling costs by choosing natural gas," says Roger Dall'Antonia, president and CEO of FortisBC. "This is the first Canadian province that UPS Canada chose to enter with natural gas vehicles because of the incentive funding provided by FortisBC which assists with the purchase of new CNG vehicles as well as our support in building and operating a fuelling station. 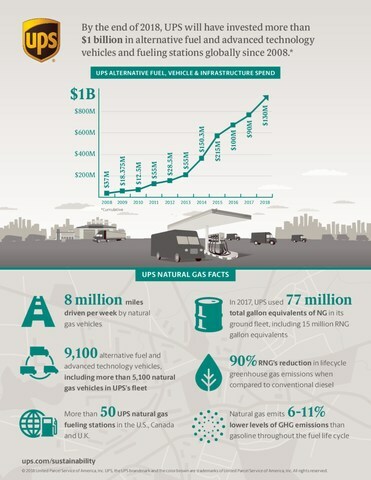 UPS Canada now joins numerous fleet owners and operators across North America making the switch to natural gas so they can save on fuel costs and shrink their environmental footprint." "It's great to see UPS Canada and FortisBC as leaders in reducing greenhouse gas emissions," says Michelle Mungall, Minister of Energy, Mines and Petroleum Resources. "Putting new compressed natural gas vehicles on British Columbia's roads can help us reach our climate commitments. Our government continues to focus on clean energy alternatives that build an economy benefiting everyone." UPS takes a rolling laboratory approach to its fleet. Vehicles with alternative fuel solutions are tested and deployed depending on terrain, climate and other local considerations. In Argentina, France, Germany, Netherlands, Thailand, U.K., and the U.S., UPS operates more than 3,800 CNG-fueled tractors and package cars. On June 19, the company announced a $130 million investment to build an additional five CNG fueling stations and add more than 700 new CNG vehicles throughout the U.S. Globally, UPS will have invested more than $1 billion in alternative fuel and advanced technology vehicles and fueling stations from 2008 through 2018 https://bit.ly/2MEnokk. On June 26, UPS will release the 2017 Sustainability Report which outlines progress the company has made in reaching global sustainability goals, including aims to replace 40 per cent of all ground fuel with sources other than conventional gasoline and diesel. 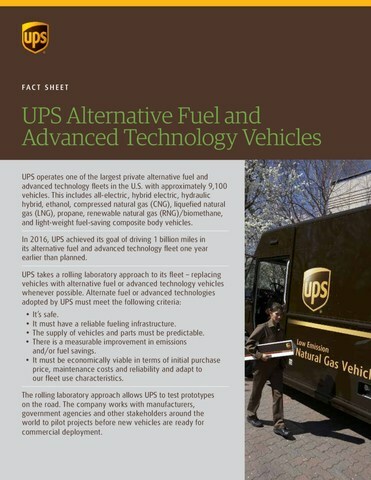 For more information on UPS's sustainability initiatives and to view the sustainability report, please visit www.ups.com/sustainability.